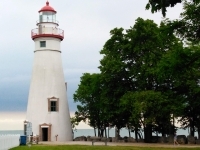 This month's Magical History Tour takes us on a pleasant drive west via I-90/OH 2 to Marblehead Lighthouse, located at Marblehead State Park not too far from Kelley's Island, Put-In-Bay and Cedar Point. Hours are noon to 4 p.m., seven days a week, from Memorial Day weekend through Labor Day, though the park grounds are open year-round. Entry to the museums are free; for those aged 5 and older wishing to climb the lighthouse tower there is a $3 (cash only) tour charge. On the edge of rocky Marblehead peninsula, jutting out into the gray waters of Lake Erie, a white lighthouse capped in red stands tall, the sunlight glinting off of its windows. Come nightfall, a brilliant green LED light will shine across the water, signaling vessels up to 11 nautical miles away, the same as every other night since its beginnings in 1822, though its methods of doing so have certainly changed. The oldest continuously operating lighthouse on the Great Lakes, construction of Marblehead Lighthouse was set in motion by the fifteenth United States Congress in 1819, who appropriated $5,000 for its construction. Built by William Kelly out of native limestone, the resulting lighthouse was 50 feet high, its base 25 feet in diameter with five-foot thick walls, narrowing to 12 feet at the top with walls two feet thick. As time went on, changes in technology necessitated changes to the lighthouse, and at the turn of the century its height increased 15 feet with the addition of a new watch room and a new lantern room. A brick cylinder was constructed inside the original structure to support the weight of the larger lantern and to hold a new spiral cast-iron staircase. Today, visitors enter the lighthouse from the south-facing door, and brick-framed windows spiral up the sides, breaking up the solid white stucco façade. Topped with a cheery red-painted lantern room ringed with a matching gallery, the Marblehead Lighthouse is quite impressive during the day. At night, however, is when it was truly meant to shine (my apologies, dear reader, but I could not resist). The first keeper, Revolutionary War veteran Benajah Wolcott, climbed the structure's original wooden ladders to the top of the lighthouse and lit the wicks of 13 whale oil lamps every night, the light projected by a 16-inch-diameter metal reflector. After Wolcott's death from cholera in 1832, his wife, Rachel, took over his duties. She was the Great Lakes' first female light keeper. In 1858 the whale oil lamps were replaced by a single, multi-wick lamp and a fourth-order fixed Fresnel lens; together they created a bright, constant white light that could be directed across Lake Erie. 1866 saw the replacing of whale oil by lard oil, which was itself replaced by kerosene in 1880. Modern conveniences came later; electricity took over in 1923, and the beacon was automated in 1958. Today's visitors who make the climb up the 77 stairs to the top will find the new LED light, and can view the last Fresnel lens used in the lighthouse in the nearby Keeper's House Museum. The Keeper's House Museum is a mere stone's throw away from the lighthouse, where artifacts, photographs and other objects tell the story of the lighthouse and the people who cared for and interacted with it. Bright white with merry green shutters, the keeper's house was built in 1880 to host both the keeper and the assistant keeper, as well as their families. From 1822 to 1943 there were 16 keepers in all, though not all of them lived in this house. After 1943, when the U.S. Coast Guard took over the lighthouse responsibilities, the house was used as a dormitory. 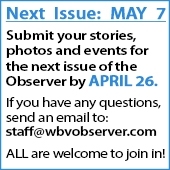 In 1968 the State of Ohio assumed ownership of the property, which became a state park on June 9, 1998. The museum was opened by the Marblehead Lighthouse Historical Society in 2000. Visitors can also see a replica of the first keeper's house, also known as the Wolcott House after its first family, located 2.7 miles west of the lighthouse. Also located on the park grounds is the delightful Lifesaving Station Museum, a 2016 addition modelled after the 1876 U.S. Lifesaving Station. Boating safety, histories of the Lifesaving Service and the U.S. Coast Guard, and information about the Great Lakes shipping industry abounds, highlighted by a splendidly restored 27-foot Coast Guard Rescue Boat and launching railway. While no boats are currently launched, the spot is ideal for fishing, with quite a few places for casting lines located at various points around the water. Picnic tables are available, and the views of the lake and surrounding islands are very pleasant. Shopping and dining are a short drive into Marblehead village, and those interested in other attractions could venture on to the nearby islands. And if, at the end of the day on the islands, as you board a ferry headed for the mainland as the sun dips down below the horizon, a flash of green should happen to catch your eye, you can sail assured that the Marblehead Lighthouse is still on duty, just as it has been for nearly 200 years. I live in Westlake with my husband and our two sons. I work as an Alterations Specialist at David's Bridal. In my free time I like to read, write, and cook. My family and I take part in War of 1812 reenactments throughout the summer. My lofty dreams are of traveling abroad, visiting the great museums, and drinking all the coffee. For now I content myself with antiquing and Keurig sampler packs.